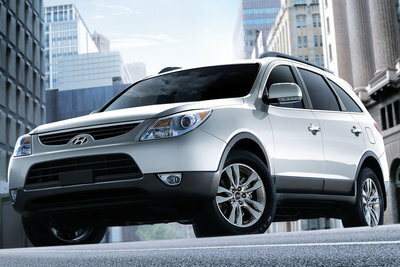 When Hyundai introduced the Veracruz in 2007, they positioned it as a value-priced alternative to the Lexus RX350 and Nissan Murano. In truth, the Veracruz was one of several 7 passenger crossover SUVs arriving for the 2007 model year. The Veracruz features a standard 3.8L V-6 mated to a 6-speed automatic and is available with FWD or an on-demand AWD driveline. An adult-friendly 3rd row seat folds down to create a flat load floor. With its comfortable ride, roomy interior and exemplary refinement, the Veracruz should appeal to customers looking for good value in a three-row SUV.